It's raining here again today....it is so dark...I'm wishing for a sunny day. I think there are still questions about the covered box. So today we will do a bit of Q & A. Couple of questions--is there a particular type of paper you copy your sampler onto? And is PVA equivalent to Elmer's? Thanks so much for sharing. 1. The paper used is the regular paper loaded in the copy machine at Kinko's. Kinko's or Fex-Ex Office is my favorite place. They have great copy machines and a staff that is willing to help if you need it....but they allow you to use their machines without their help too. Just right to play uninterrupted with a many-thousand dollar machine making images of my samplers. 2. The Paper Source PVA glue is not the same as Elmers. When you use it on paper and fabric you don't get the wrinkles you would get with Elmer's. It is archival and acid free. It is not water soluable when dry. It is flexible when dry. It is specially formulated to work with paper and cardboard. 1. Margaret....you are on your own! I love you dearly, but I'm not helping with the dust problem. I've got my own dust issues here! Hello, I did what you say to cover the boxes, and my first one went well, but my second attempt the fabric bubbled all along the sides of the box. So the top and bottom fit well but bubbled in the centers, do you know what I did for this to happen ? 1. There are a couple of things you might check. Are you using the right glue? Also, stretch the fabric a bit as you put it on the box. When it fits tightly there is less chance of ripples or bubbles. Run your fingers over the fabric to make sure it feels smooth and there are no air bubbles under the fabric. Ooh pretty! You are so creative and inspiring and have such clever ideas. Thank you for the tutorial - you did make it look so do-able! I have now collected fabric, PVA, cross stitch finishes to photocopy (hope the local library's copier does colour) and I'm now going to search for a suitable box or two... or three! 1. I'm so glad you are going to try! It has taken me several boxes to really get the hang of it! Remember if the first one doesn't turn out exactly like you want ....try again! It's fun. What do we put in a sewing box? 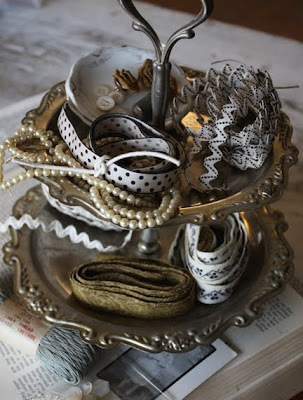 Beautiful trims, that's what! You have to check out Nifty Thrifty Dry Goods. Susan Gower goes to Quilt Market each year. Every time we see her booth Barb and I go crazy. I think it's the display of color. If you love to stitch....you love color. 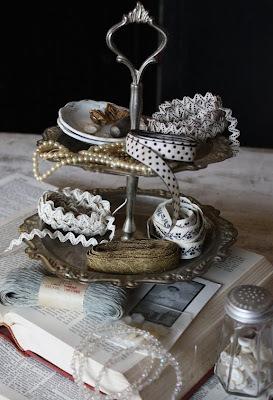 Floss, fabric, wool....we love to collect it all. Trims are my new downfall. Susan came to the Sewing Expo in Kansas City last week. I offered to help her unload her car and set up her booth. You can't imagine the work she goes to taking all of these trims on the road. She's leading the Gypsy life for sure. She loads up her van and travels for weeks at a time going from show to show. Click on the shop name above and take a minute to check out her site. You will be glad you did! Also Click on the "About Us" button on her site. Scroll down and you will see her Grandmother. Susan's Grandmother had a store, called Smith's Nifty Dry Goods. I just wish Susan's Grandmother could see her booth! She would be proud. If you love trims, you really must visit The Trimtex Store in Williamsport, PA.
P.S. LMK when you are coming!!!! Thank you SO much Alma for posting all the box-making directions! I know it takes a lot of time to take all those pictures and post it,etc. You rock! I can't wait to try making my own. I found that there is a warehouse for trims and fabrics near where my daughter moved too. I know where I am going when I head up there. Wow - what a great tutorial.. all the pic's really help. Now I know what my next project is going to be this weekend. Guess I'll hit the craft shop tonight after work to find a box..
Hi Alma! Thanks for the great instructions. I contacted Rit Dye because I would like to know if the color remover is safe for the environment. Unfortunately I have not received a reply. We live in the country and have a septic system. I'm not sure how to dispose of the dye water. Perhaps someone knows? What about a square or rectangle box? How would you finish the corners?? Thanks for the directions, great pics including the glue on you fingers, I'm glad I'm not the only one whose fingers are gluey!!! Good evening ladies: I would like to comment about the bubbling on the fabric for Patchysails. I once had this problem and found out the hard way that if you put to much glue on the box the under lying paper will bubble, I poked a small hole in the fabric and put a small drop of glue in and than worked it around with my finger, I hope this helps. Great web site and Thank-you for the copy idea. 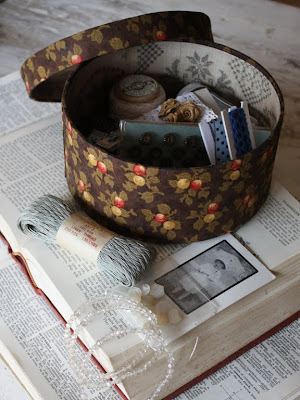 I'd love to blog about this very cool sewing box project. Please let me know if it would be okay to include an image of the finished box in my post (tammypowley @ yahoo.com).